There is an abundance of atmosphere to be experienced in the high cliffs and dramatic coastline that surround the popular tourist village of Tintagel. It is an atmosphere that conjures up visions of the past and poses questions about the people who lived and worked here centuries ago. It is, also, easy to see how legend, stories and historical fact become entwined to offer the inquiring visitor many avenues of interest to pursue. . Go beyond the commercial life of the village centre out to the cliffs and the coastal path. Find your way to Glebe Cliff (NT) and Tintagel Church, St Materiana, standing proudly on its own, buttressed against the mighty storms of the Atlantic. 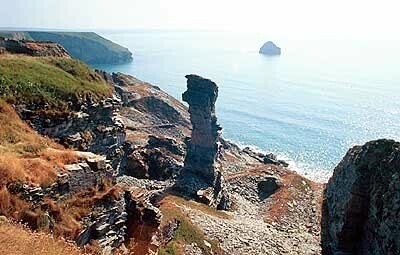 A great view of Tintagel Island can be admired from the cliff top directly behind the church. Make time to follow the cliff path south past giant slate stacks standing just off the cliffs, and go at least as far as Trebarwith Strand. The coastal path between Tintagel Church and Trebarwith Strand is a pleasant walk, and for the keen eye, there are many reminders of times past and the hardships of coastal slate quarrying, which began here in the late 1400's. Beyond the church to the south, you will find a low white building which was once the offices for the slate quarry and is now the youth hostel perched on a ledge on the very edge of the land. Catch the sinking evening sun at the right time and the slate waste, abandoned down the cliff face, glints purple and gold in the dimming sunlight. Tintagel Cove from a hand coloured engraving c1840. A boat is moored below the towering cliffs, high above are the ruins of Tintagel Castle. The derrick perched on the cliff edge was probably, in the main, used to load cargoes of slate from the nearby cliff face quarries. Today, it is difficult to imagine the perilous situations that must have been experienced by sailors bringing cargo boats under sail into this small cove beneath the towering cliffs; the sea is rarely calm or forgiving here. For information on the vicinity, and to gain an understanding of Tintagel's Arthurian connections, go to the public car park in the centre of Tintagel and call in at the new Visitor Information Centre which has some splendid interpretation display panels. For the Arthurian enthusiast, a visit to King Arthur's Castle and King Arthur's Great Halls is a must. The Old Post Office, in the ownership of the National Trust, is a fine example of a 14th Century Cornish Manor House, and can be viewed between early April and late October. Barras Nose, the headland to the north of Tintagel Island, was the National Trust's second land acquisition in Great Britain in 1912. If the commercial life of Tintagel is not to everybody's taste, then, surely, The Island and the nearby clifftop walks will be, for they offer some of the finest coastal scenery to be found in England. The cliffs surrounding Tintagel are some 300ft in height, which provides for dramatic coastal scenery and sounds, as they are continually pounded by the might of the Atlantic Ocean. On stormy days, the fierce winds will drive the sea spray and foam above the cliffs and some distance inland. In the Summer months, swimming, best between low and half tide, may be enjoyed at Bossiney Cove which lies just outside the village off the road between Tintagel and Boscastle. Much of the immediate coastal area around Tintagel is owned by the National Trust and comes within the national designation of "Atlantic Heritage Coast". The trust also owns the "Old Post Office", which is a small building dating from the fourteenth century, a traditional and exceptionally well preserved Cornish Manor House of the time. From 1844 until 1892, the building was the receiving office for post, hence the name by which it is known today. Open from early April to the end of October. Visitors first came to Tintagel in significant numbers after the railways were established. The commercial activity surrounding Tintagel and the Arthurian legends began in earnest with the opening of the nearby station at Camelford in 1893. An enterprising businessman saw the opportunities and built the large building so prominent against the skyline and known as King Arthur's Castle Hotel, in recent times renamed Camelot Castle. For many, the building was seen as a blot on the landscape built to accommodate the 'new tourists', without a thought for the natural beauty of the area. To prevent further development along the cliff, a local group was formed, and, as a result of the publicity they achieved in opposing such developments, the National Trust acquired 14 acres of Barras Nose, and its very first strip of coastal land.